One cannot underestimate the talents of the legendary Tony Award-winning actress, singer and media figure Ethel Merman, The Grand Dame of the Broadway Stage. Possessing a distinctively clear, concise, and powerful belting voice with precise pitch, she was the unrivaled American musical theater performer of her generation, Broadway’s golden era. The First Lady of the Broadway Stage has worked with several performing arts luminaries such as George & Ira Gershwin, Cole Porter, Irving Berlin, Rodgers & Hammerstein, Stephen Sondheim and Jule Styne and has received praise from popular music artists such as Perry Como and tunesmiths such as George Gershwin. She introduced popular tunes that have become part of the American songbook such as “I Got Rhythm,” “There’s No Business Like Show Business” (her signature), “Everything’s Coming Up Roses,” “Some People,” and “Anything Goes.” In an over 50-year career, Ethel Merman remains one of the greatest and most colorful American vocalists and artists of the 20th century, and her influence is widely felt to this day on Broadway. 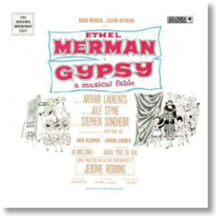 Merman’s performance of a lifetime, her creative peak, was her mesmerizing role as mother Rose in the seminally revered and archetypal Broadway musical Gypsy: A Musical Fable (1959). Heralded as the greatest American musical by countless critics, Merman’s stage performance was a force of nature, displaying her robust vocals that needn’t rely on amplification or gimmicks. Its success spawned a film version in 1962 and a series of Gypsy revivals on Broadway throughout the decades. Masterworks Broadway has given the original 1959 classic Gypsy Broadway cast recording a 2009, 50th-anniversary reissue, rounded out with new bonus tracks, new production photos, and a Stereo “360 Sound.” The original Gypsy cast recording was produced by the legendary and influential figure Goddard Lieberson (he introduced the seminal long-playing record to Columbia Records and also produced several classic original cast recordings including Rodgers & Hammerstein’s evergreen Oklahoma!). But this time, the re-release is taken under the wings of Didier Deutschand and Thomas Z. Shepard. Inside the CD jacket is a booklet of liner notes that describe Styne’s and Sondheim’s musical and lyrical vision of Gypsy and, reprinted from the original LP, the story behind the musical itself. Act I features the bulk of Merman’s performances, comprised mostly of bouncy, lighthearted fare (“Some People”) set alongside rare balladry (“Small World”). Unlike previous editions, those familiar with the recording will take heed of alterations in “Let Me Entertain You” and “Rose’s Turn” in Act II. The producers Deutschand and Shepard have restored some bars in “Let Me Entertain You”, and the triumphant and boisterous “Rose’s Turn,” which remains Merman’s crowning achievement on this record, has a corrected trumpet note and a moving reading in two bars (“All your life and what does it get you”). The bonus tracks begin with track 17, starting off with an alternate take of “Some People.” The next tune pairs “Mr. Goldstone” with “Little Lamb” (Merman originally did not sing “Little Lamb” in the musical). The last three numbers on the record have never appeared on the original cast recording nor any reissue since. “Who Needs Him?” is a publisher’s demo from 1959, followed by a 1990 interview with composer Styne. Gypsy ends with a burlesque number performed by Gypsy Rose Lee in which she recalls her childhood and professional career, also recorded in 1959. The 50th Anniversary reissue of Gypsy: A Musical Fable is well worth the purchase for its comprehensive liner notes, production photos and engaging bonus tracks. With her booming, vibrant voice and larger-than-life persona, Ethel Merman’s performance here remains a guide and testament to the ultimate Broadway female performer. Georgian-born New Yorker singer-songwriter Mary Bragg was exposed to gospel, country and rock music growing up, and such a mixture is present on the largely creamy-voiced and honeyed instrumentation of Sugar, Bragg’s 2007 sophomore effort. Taking inspiration from legends such as innovative singer-songwriter-musician Joni Mitchell and popular Americana/pop-rock artists Patty Griffin (Bragg is often compared to Griffin), Sugar, displayed in a four-fold cardboard box, is more than just simply a musical confection. It demonstrates a woman blossoming into a more mature career, adding greater craft and depth after gaining critical attention with her 2004 debut Certain Simple Things. The set launches with the lulling, gentle and attractive “Let Me,” a song which turned Bragg into a finalist at the International Songwriting Contest, before it gives way to “Child,” which is soaked in soothing vocals while a dark tale of child custody develops. The fluid sweetness that envelops the ambiance of the album then takes a complete roundabout with the cautionary “Sweet Skin,” where Bragg exercises an assertive voice paralleling great guitar accompaniment. “The Paper Chase,” the centerpiece of Sugar, marks an even further shift in that it focuses on corporate politics, opening with an exuberant piano introduction before drums and electric guitar chime in to create an upbeat, lightweight rhythm section. The backdrop stalls mid-record as a great bluesy guitar solo kicks in. 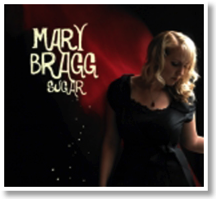 Mary Bragg’s endearing and melodic Sugar should fulfill those favoring a rich, caressing vocal delivery underpinned by spare instrumentation and themes of romance with bits of social concerns. It’s Americana folk-pop ear candy at its sweetest. “There Goes Another Love Song,” a 1975 hit single by the Outlaws, is a classic Southern rock number. 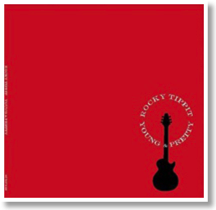 Such a song title is a fitting theme for Texan singer-songwriter-musician Rocky Tippit’s current release Young and Pretty. The album is built on a love-coated Southern rock foundation. “If you are not in love with a person, or an idea, then you can’t really care about it, and there’s no music in it,” he clarifies. Penning all the songs (he shares writing credit on “Raw”) and co-producing and co-engineering the record, Rocky opens with the driving “Burn,” (“I’ve had enough/I’ve learned to love/And still it didn’t change a goddamn thing”). This is perhaps the standout tune alongside the weeping guitar work of “Never” (“I will love you always/But I can’t reach you nowadays/I can’t touch your heart of stone”). The steady groove of the title track encapsulates the record’s subject matter, but what is more superb is the guitar crunch of “Texas Sun.” “Sun” (“The Texas sun, it burns my skin”) is the heaviest track on the album, paying homage to the several hard-rocking numbers performed by Southern rock titans Lynyrd Skynyrd (the album’s “Wait” is another up-tempo, pounding side). Before departing from his musical journey of love, Rocky leaves us with “White Cadillac.” It has traces of ‘50s rockabilly (why not the iconic pink Cadillac of the rockabilly rebels? Maybe Rocky wanted to give everything a different spin). Young and Pretty is just that. No, we’re not talking about Rocky, but what the ideals of love should be. That’s not to say that love is a very simple matter. While the album is not boundary-stretching, it does leave a good taste in Southern rock’s mouth and should whet your musical appetite if you want a bass-guitars-drums lineup of love-drenched Southern rock. And Rocky Tippit excels with great tenacity. Harvey, a drummer for Ian McLagan & the Bump Band, has performed with dynamite legends such as Bruce Springsteen and Pete Townshend as well as Joe Ely, Billy Bragg, and Ian Matthews. Now, Harvey has assembled some of Austin’s finest musical talent such as Ephraim Owens (trumpet), Brian Standefer (cello), Guy Forsyth (harmonica), John Mills (bass clarinet), and Bukka Allen (accordion) to supply some music for his debut EP consisting of four stirring instrumentals. “Desert Meets the Sky at Twilight” is the breadwinner in this family of musical soundscapes. Marinated with piano, trumpet and lap steel, “Desert” evokes the lazy sway of summer. “Dance in Red” is decked with strong Middle Eastern trappings, augmented by cello and accordion, and is a direct nod to two of Israel’s best-known recording artists, Jonathan Geffen and David Broza, with whom Harvey worked with in the late ‘70s. The meandering “The Wish (For Dad)” opens with bass clarinet and is punctuated by tinkling piano while “Flowing Home” contains floating drums and harmonica. 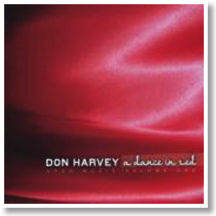 In the Middle East, the color red symbolizes sacrifice, courage, love and passion, and Harvey and his local star-studded affair capture that mood in A Dance in Red: Open Music Volume I. Whereas Harvey was more of a timekeeper in the Bump Band, here he is able to display the full extent of his talents in a thoroughly engrossing musical setting.